With heavyweight and olympic alternate Brandon Lynch taking a first round bye and junior welterweight Abraham Nova turning pro, it would seem as if there was a talent gap in this year’s tournament absent the two Albany fighters. Into the talent vacuum of the Buffalo Golden Gloves, enter middleweights Timi Akeredolu, David Rivera, and Wilmont Wood while casting a keen eye on Jah Ley Brown, Avory Lewis, Messiah Miles, and Akhmed Aliyev. The showdown between Akeredolu and Rivera was Sunday’s main event that lived up to organizer Don Patterson’s hype. Though only a few hundred of the once-large crowd were still in the expansive RiverWorks venue to see it, Akeredolu and Rivera put on a show that played out mostly in the center of the ring, where the two young pugilists anchored their feet and swung away. Though both fighters are perfectly capable—physically, at least—of fighting beyond the brawler style, they choose to do battle in a three round sprint of a fight. Training for boxing is a long, blood, sweat, and tears process. Because the Golden Gloves gives amateurs three rounds of two- or three-minute fights (depending on ring experience), the door opens for young athletes to explode from the opening bell. Most who do that burn out by the fight’s midway point, the ones who pace themselves betray their level of experience, and the rare fighters who can keep that pace for six, or nine minutes really separate themselves. Akeredolu and Rivera both exemplified that ability. In the first round, the Juan Deleon-trained Rivera was sharper and more effective, finding small holes in Timi’s defense to poke through included a short left hook that landed on the UB Boxing Club’s middleweight. But starting in the second round, after consulting with his Dean Eoannou in his corner, Akeredolu took the unusual step of fighting smaller against a smaller boxer. Most taller fighters employ their reach to keep their opponent outside; Akeredolu switched the philosophy and stayed in the kitchen, guarding first against body shots with his elbows and using his long arms to guard his head. The position allowed him to thwart Rivera’s attack, and counter with volume with smart and varied punching. The UB finance graduate’s strategy proved difficult for Rivera to crack. Preternaturally more of a brawler by style, Rivera couldn’t resist Akeredolu’s standing invitation to do some inside cooking. Close fight, but the judges saw the effective work done by Akeredolu, who landed repeatedly on an impervious Rivera, and gave him the decision. Progressing through the tournament, Akeredolu will face a tough out in Rochester’s Wilmont Wood. Wood has routinely been one of the tournament’s most impressive fighters through the years, and his clinical and prodigious decision win over the very game and very sturdy Adenawal Ledesma announced Wood’s return as a fighter of status. Last year, Wood beat Akeredolu in the finals to progress to the national championships, where Wood has been one of the Buffalo contingent’s best representative in recent years. A rematch looms. Golden Gloves fighters at the top of their division are used to facing familiar opponents in the opposite corner. Consider the cobra and mongoose pair in Buffalo’s Jeffrey Nyagyot Olingou and Rochester’s Sequan Felton, who have faced each in amateur bouts a half-dozen times over the years with Felton usually getting the better of Olingou. Last year, Felton beat him in the finals to progress to the nationals in Las Vegas. This time, Olingou appeared to have more in the tank as the fight wore on and credited a better training and diet regimen. 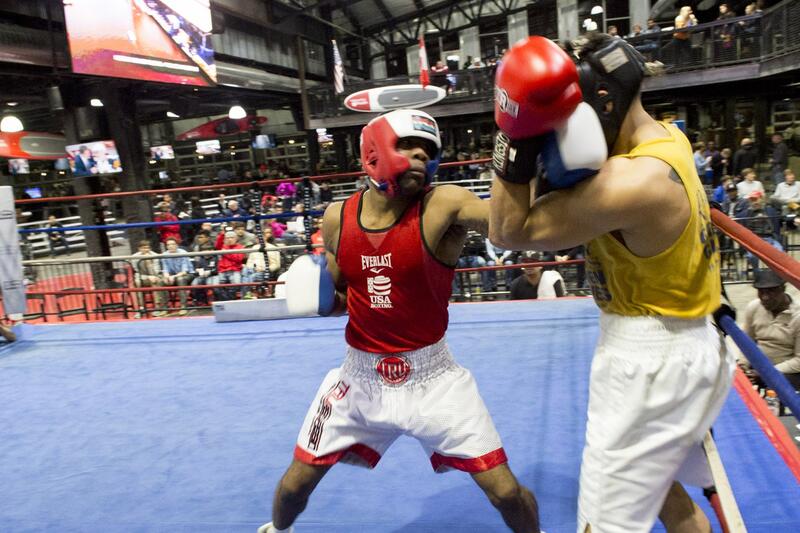 The Golden Gloves tournament broke new ground in Sunday’s lineup of twenty one amateur fights, hosting the bouts in a new venue along the Buffalo River. Hundreds of spectators filled the seating and bar areas around the large center area of the complex with the boxing ring installed on the edge of the roller derby paint and hockey and curling taking place on the adjacent outdoor rinks. Rochester’s Messiah Miles scored an impressive victory over a tough Robert Suarez. Behind a piston jab, Miles worked through Suarez’s body assault to eventually put together a combination that stunned the Buffalo fighter into the ropes at the end of the second, ending the fight. Mitch Geles clinched a seesaw battle against Elmira’s Vinnie Denierio by dealing him a standing eight count in the third round of an open division fight at 141 pounds. Gloves veteran Akhmed Aliyev may have turned a corner with his scrappy and resourceful performance against Jarrill Haadi. The young 141-pounder who trains out the Northwest Buffalo Community Center’s gym outlasted Haadi, mixing his punches and staying aggressive. The longer Gabe Colon overpowered Aaron Bernal with a two-round TKO victory in a 141-pound fight. Schenectady’s Luis Ortiz bested Buffalo’s Alex Castellano with a UD at 123 pounds. Kyshawn Stone (Rochester) won the decision over Edwin Vera (Geneva). Tracy McGruder (Rochester) rode effective body punching over Ben Wright (Schenectady). Jeremy Gonzalez (Buffalo) won a majority decision over Zack Speed (University at Buffalo boxing). Elon Dejesus split-decisioned DeAndre Hackerson (Rochester). Liam Grogan (Buffalo) defeated Derek Greene (Buffalo) at 132 pounds, with Greene sustaining an injury to his left hand. Greg Webb (Rochester) won a majority decision over Richard McBride (Syracuse) in a novice 152 pound fight. Gerrel McFadden (Albany) scored a TKO2 over William Miller (Buffalo). Jah Ley Brown (Albany) scored an impressive UD over Golden Gloves toughie vet Jarred Nosewicz (Syracuse). Raquan Shadreem (Syracuse) earned a split decision over Albert Torres (Albany). Eudy Tavarez (Syracuse) won a decision over Rashad Griffin. And Charles Garner won a toss-up majority decision against Ray Jay Bermudez. The next round of the Gloves will occur on February 20, at the St. Stanislaus Social Center on Peckham Street on the city’s East Side.